Preheat your oven to 200C/ 400F. In a lightly oiled frypan on medium heat, fry the tomatoes and mushrooms for a few minutes so they brown slightly. Throw in the spinach leaves, continually stirring so they don’t burn but instead wilt slightly (approximately 1-2 minutes). Remove from heat. Optional here: Add some crushed garlic. Spoon a half the tomato/ spinach mix into each ramekin then crack 2 eggs on top, keeping the yolk whole. Sprinkle with parmesan cheese and season with pepper. Cook for around 15 minutes until the egg is cooked through. Serve with plain or lightly buttered wholegrain toast. 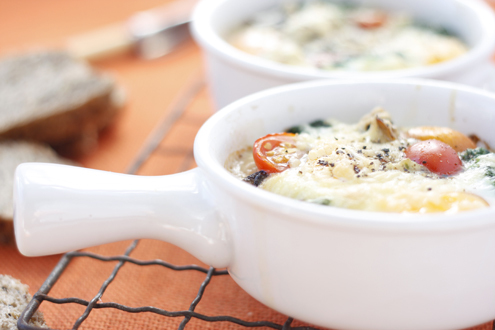 *A ramekin is a 1-serve ovenproof dish. I can’t wait to try this recipe! I have eggs every morning for breakfast and am getting tired of having them the same way every time. I’ve tried a few of the other recipes on this website and they’ve been great…my blood sugar level was always fine afterwards even though sometimes I didn’t follow the recipes exactly. Thanks again and keep the recipes coming!